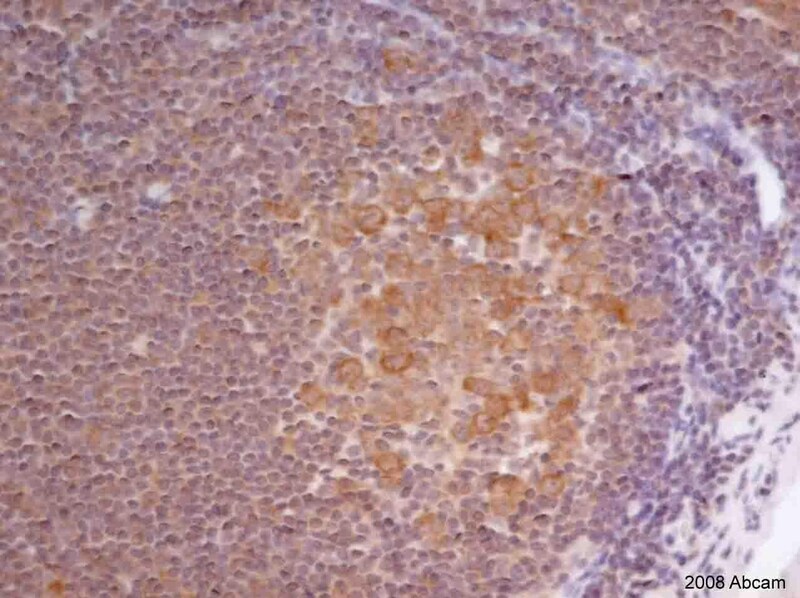 This antibody is specific to ATIC. Synthetic peptide corresponding to Human ATIC aa 583-592 conjugated to Ovalbumin. Recombinant Human ATIC protein (ab114743) can be used as a positive control in WB. colon carcinoma. Our Abpromise guarantee covers the use of ab33520 in the following tested applications. WB Use a concentration of 2 µg/ml. Detects a band of approximately 65 kDa (predicted molecular weight: 65 kDa). Purine metabolism; IMP biosynthesis via de novo pathway; 5-formamido-1-(5-phospho-D-ribosyl)imidazole-4-carboxamide from 5-amino-1-(5-phospho-D-ribosyl)imidazole-4-carboxamide (10-formyl THF route): step 1/1. Purine metabolism; IMP biosynthesis via de novo pathway; IMP from 5-formamido-1-(5-phospho-D-ribosyl)imidazole-4-carboxamide: step 1/1. Defects in ATIC are the cause of AICA-ribosuria [MIM:608688]; also known as AICA-ribosiduria. AICA-ribosuria is a neurologically devastating inborn error of purine biosynthesis. AICA-ribosuria patients excrete massive amounts of AICA-riboside in the urine and accumulate AICA-ribotide and its derivatives in erythrocytes and fibroblasts. AICA-ribosuria causes profound mental retardation, epilepsy, dysmorphic features and congenital blindness. Belongs to the purH family. The IMP cyclohydrolase activity resides in the N-terminal region. ab33520, at a concentration of 5 µg/ml, staining ATIC in Human colon carcinoma tissue by Immunohistochemistry. Overlay histogram showing HeLa cells stained with ab33520 (red line). The cells were fixed with 80% methanol (5 min) and then permeabilized with 0.1% PBS-Tween for 20 min. The cells were then incubated in 1x PBS / 10% normal goat serum / 0.3M glycine to block non-specific protein-protein interactions followed by the antibody (ab33520, 1µg/1x106 cells) for 30 min at 22ºC. The secondary antibody used was DyLight® 488 goat anti-mouse IgG (H+L) (ab96879) at 1/500 dilution for 30 min at 22ºC. Isotype control antibody (black line) was mouse IgG1 [ICIGG1] (ab91353, 2µg/1x106 cells) used under the same conditions. Acquisition of >5,000 events was performed. This antibody gave a positive signal in HeLa cells fixed with 4% paraformaldehyde (10 min)/permeabilized with 0.1% PBS-Tween for 20 min used under the same conditions. Publishing research using ab33520? Please let us know so that we can cite the reference in this datasheet.